2. Fast app switching – with multitasking available now, the apps can just remain frozen when closed, so that when you reopen them, they are restored to exactly the same state they were in when they were closed. 3. Local Notifications – It will be the same as before, but there’s also another one: Local Notifications. They’re just like push notifications, but you don’t need a server. 4. App folders – This is something which excited me. Now you can sort your apps into folders! 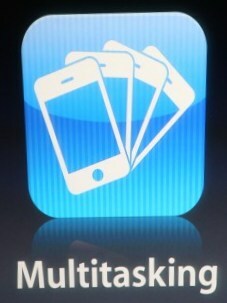 This means you can have almost 2000 apps stored in your iPhone/iPod Touch. 5. Unified inbox – Multiple Exchange accounts! Fast inbox switching! Threaded messages! 6. iBooks - This looks exactly same as the one on iPad, nothing great anyway. 7. Custom backgrounds – one of the main reasons given to jailbreak iPhones was ability to have custom backgrounds. Now you can choose a persistent background for your iPhone—and not just for the lockscreen. 9. iAd mobile advertising – Google, sit back and take a look. Apple has finally rolled out their advertising platform – iAd. You can watch videos, play games, and even buy apps from within these ads. 10. 5x digital zoom – This might be a hint for a better camera in newer versions of iPhone. As mentioned before, iPhone 3GSes and iPod Touch 3rd-gens devices will get all of the features. The iPhone 3G and Touch 2G will get “many things,” which doesn’t include multitasking. Bad news for iPhone 3G and 3G users.